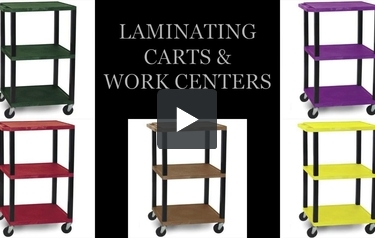 MyBinding.com carries a wide selection of laminator work center carts, stations, cabinets, and stands. These multi-purpose utility equipment work centers easily allow for your business to carry around, store, and quickly move your laminators, binding machines, laminating roll film, supplies, and more. These laminator carts and cabinets feature a convenient way for any business to make all of your heavy equipment easily portable. Check out the wide selection of carts listed below and feel free to give us a call if you have any questions. For Use With Fujipla ALM 3230 Laminator. Dimension(Assembled): 24" tall x 19" wide x 22" deep. Metal rack for laminated items. Welcome to MyBinding video. MyBinding.com carries a wide selection of laminator work-centric carts, stations, cabinets and stands. This multi-purpose utility equipment work centers easily allow for your business to carry around, store and quickly move your laminators, binding machines, laminating roll of film, supplies and much more. Our laminator carts and cabinets feature a convenient way for any business to make all of your heavy equipment easily portable. Give us a call. Our knowledgeable staff is at the phone to help you find exactly what you need or click around here on our site to check out the wide selection of laminator, binding and audio-visual carts that we have below. When image matters, MyBinding.